Belly was ecstatic when Conrad, the son of her mom’s best friend and the boy she’d loved for years, finally kissed her. But when Conrad’s mom dies, he withdraws from everyone and eventually disappears completely. Not sure where to start looking, Belly and Conrad’s brother Jeremiah figure Conrad’s college is a good place to start—but they soon learn he’s actually at the family beach house. When Belly and Jeremiah find Conrad, they realize he wasn’t running away—he’d come to keep the house from being sold. Belly’s romantic feelings for Conrad begin to resurface even as she’s growing closer to Jeremiah, and as emotions run high, it’s unclear if things will ever go back to normal—especially when a real estate agent shows up. 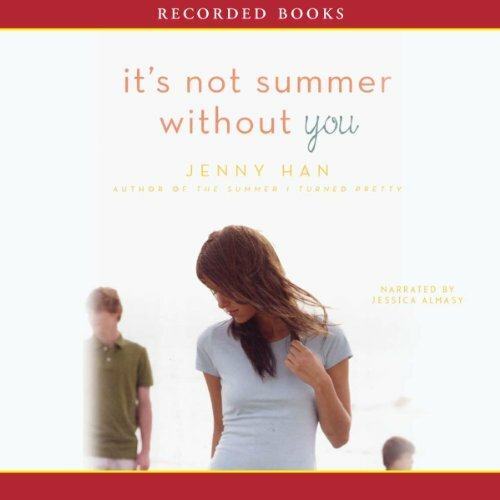 Popular author Jenny Han captures perfectly how young people think when it comes to relationships. Jessica Almasy’s narration flawlessly reverberates the author’s style and heartwarmingly reveals the details of the characters’ relationships. I loved this book and highly recommend it, in particular to teenagers. A great story. I loved it! I really enjoy Jessica Almasy as Belly. This book kept me hooked the whole time. I'm really loving this series! it's quite confusing at times with the constant time jumps back and forth between past and present without any indications but the story is so compelling that it almost doesn't matter. The narrator does a wonderful job and her voice is just perfect and animations on point! Honestly, I cannot wait to read the next book. Can this just be a summer series on TV already! I absolutely loved It's Not Summer Without You.It was amazing. I recommend this book to anyone that loves juicy love triangles. I also love the fact that they have a conflicted male character, it just makes it even more exciting! As a plot i most certainly enjoyed it more than the first book the story is really getting exciting ..
Dieses 2. Buch der Reihe ist mindestens genauso wunderbar wie das 1. Ich habe alle drei gelesen und nun nochmal angehört. Es bringt einen zum Weinen und zum Lachen. Dieses unbeschreibliche Sommergefühl wird trotz trauriger Stimmung vermittelt, auch dank all der Rückblenden. Auf jeden Fall empfehlenswert für alle, die den Sommer und die Aufs uns Abs des Lebens lieben.